MDC’s School of Justice partners with International Solidarity for Human Rights and Rebolledo Consulting Group to Present Organized Crime Specialist, Dr. Alejandro Rebolledo, Who Will Attempt to Set Guinness World Record Title for Longest Crime Prevention Lecture. Miami, Jan. 25, 2018 – Miami Dade College’s (MDC) School of Justice, Public Safety and Law Studies, in partnership once again with International Solidarity for Human Rights (ISHR) and with Rebolledo Consulting Group, will host Dr. Alejandro Rebolledo, a respected Organized Crime Specialist who will lecture on organized transnational crime prevention nonstop starting at 10 a.m. on Thursday, March 8, through 1 p.m. Friday, March 9, at MDC’s North Campus. It will be the longest crime prevention lecture on record and representatives from Guinness World Records will be present to document it. The event is free and open to the public. 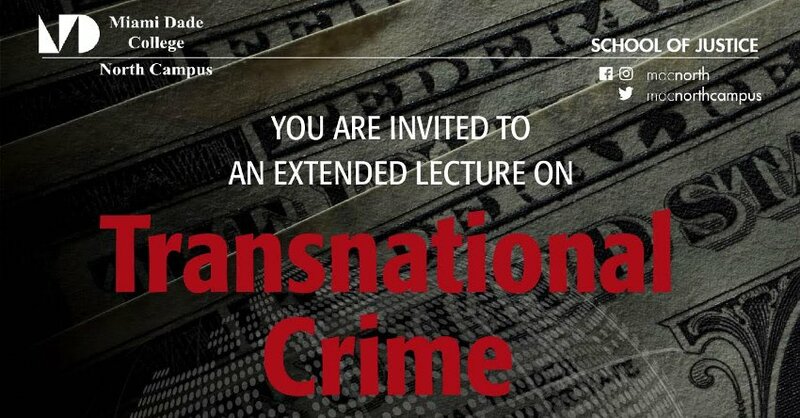 Organized transnational crimes involve more than one country in planning, execution, or impact. It is estimated that by 2030, more dangerous and diversified transnational crime will be more prevalent than common street crimes. This explosive growth destabilizes emerging states, while corrupting institutions and infrastructure worldwide. The globalization of crime is reflected in the volume of money that moves across national borders during the laundering process. There has been much written in the media about this in recent weeks. Dr. Rebolledo is a Criminal Lawyer, Ph.D. in Legal Science of Criminal Law, Specialized in Organized Crime Prevention, Certified specialist and Professor of Money Laundering Prevention, financing of terrorism and other matters related to organized crime. Dr. Rebolledo is a Supreme Court Judge of the Bolivarian Republic of Venezuela. MDC’s renowned School of Justice, Public Safety & Law Studies has been training and educating public safety professionals for more than 40 years, domestically and internationally. More than 80% of all public safety professionals in Miami-Dade County have been trained at the School of Justice. The school offers associates degrees, baccalaureate degrees, college credit certificates, certifications in basic law enforcement, corrections and firefighter, and private security, and specialized executive leadership training and assessment services. For more than a decade, MDC has collaborated with ISHR on several permanent exhibitions and installations throughout the college that are part of the Route to Human Rights, to raise awareness about the Universal Declaration of Human Rights and its 30 articles. In fact, MDC supported the ISHR in setting a Guinness World Record for “Longest Reading Aloud Marathon by a Team” in Nov. 2009, when six women read the Universal Declaration of Human Rights for more than 224 hours. WHEN: Thursday, March 8, at 10 a.m. through Friday, March 9, at 1 p.m.
WHERE: MDC North Campus, Conference Center (Building 3, second floor) 11380 N.W. 27th Ave.